Geler Perl was a Section D Mare by Derwen Desert Express out of Geler Rhiannon by Cathedine Rainbow. She was foaled in 1997. Perl was a pleasure to own and had a superb temperament. 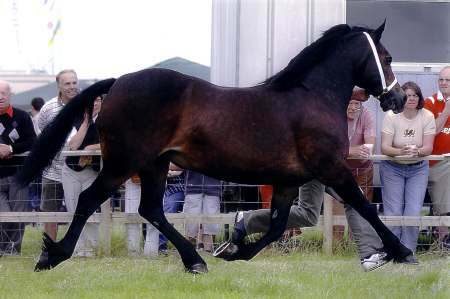 She matured very slowly into a top-class mare winning a Bronze Medal at Halifax Agricultural Show, 1st at Anglesey Show, 1st at NCPA Maelor, 3rd at Great Yorkshire and 3rd at Cheshire County in 2005. Geler Perl was owned by the Corran Stud and produced a top-class filly foal in 2004. Sadly she died in 2006 after winning the Barren Mare class at the Royal Welsh.